Running the ads was one of many Canadian attempts to improve relations between Ottawa and Washington after a rough couple of years in the early 1980s. Ottawa’s economic policies, in particular, were a serious thorn in relations. Major initiatives of Pierre Trudeau’s Liberal government, like the Foreign Investment Review Agency (FIRA) and the National Energy Programme (NEP), caused considerable frustration south of the border. Walter Annenberg blasted Trudeau’s economic policies as “Canada’s Unfairness Doctrine” in the pages of TV Guide. To those in Ottawa, it seemed as though some American critics reveled in denouncing Canadian policy, “moralizing about the evils of nationalism, interventionism, redistribution and other alleged Canadian proclivities.” The last two years, one assessment concluded in June 1982, had seen more strains in Canada-US relations than “any time since the Nixon/Connally era” a decade earlier. When Secretary of State for External Affairs Mark MacGuigan met with Malcolm Baldrige, the US Secretary of Commerce, that same month, MacGuigan asked that the Reagan administration keep ongoing trade and investment issues in perspective. Baldrige said nothing in response. At the Canadian Embassy in Washington and the Department of External Affairs, they debated how they might shape impressions of Canada and of Canadian economic policies in the United States. Discussion papers weighed the pros and cons. By virtue of US policy-making structures, there were countless parties that could impact Washington’s approach to Canada. Congress, lobbyists, the business community, and media outlets were all flagged as groups that could impact attitudes and shape policy pertaining to Canada. A “business blitz,” they suggested, might help correct the record about Ottawa’s economic policies, countering the rising anti-Canadian sentiments in Congress. Joking aside, Gotlieb’s anecdote struck at the heart of what the 1983 advertisements tried to address: a perceived lack of knowledge about Canada in the United States. The ads included facts about Canadian geography—like where Prince Edward Island was—and quips about the small differences between Canadians and Americans. The two didn’t see eye to eye on defence issues; after all, Canadians spelled it with a c! Each of the spots run in the Washington Post highlighted a shared and entangled past, mentioning everything from the International Joint Commission to the St. Lawrence Seaway. “The relations are free, firm and unfettered, our exchange of goods mutual and beneficial,” one of advertisements insisted. The Canadian argument was a simple one: both sides could win. Relations between Ottawa and Washington were bound to have difficulties and disagreements, but these problems could be resolved. Subsequent public relations campaigns have packaged and sold the idea of Canada, the good neighbour. Ads displayed throughout the Washington, DC Metro system in 2006 highlighted Canada’s contributions to the ongoing war in Afghanistan, looking to “convey an overall image of Canada as a secure and reliable ally and an important trading partner.” Under a picture of soldiers in Afghanistan, banners read “Boots on the Ground: U.S.–Canada Relations: Security is Our Business” and directed passersby to a website, the now-defunct canadianally.com. (That slogan lives on: since May 2010, the Canadian Armed Forces Defence Liaison Staff in Washington has run a Twitter account @CanadianAlly.) Officials responsible for the campaign, including Lt. Col. Jamie Robertson (one of the brains behind NORAD’s beloved Santa Tracker website), prepared a follow-up round of ads in early 2007, including in a prime location at Pentagon station. 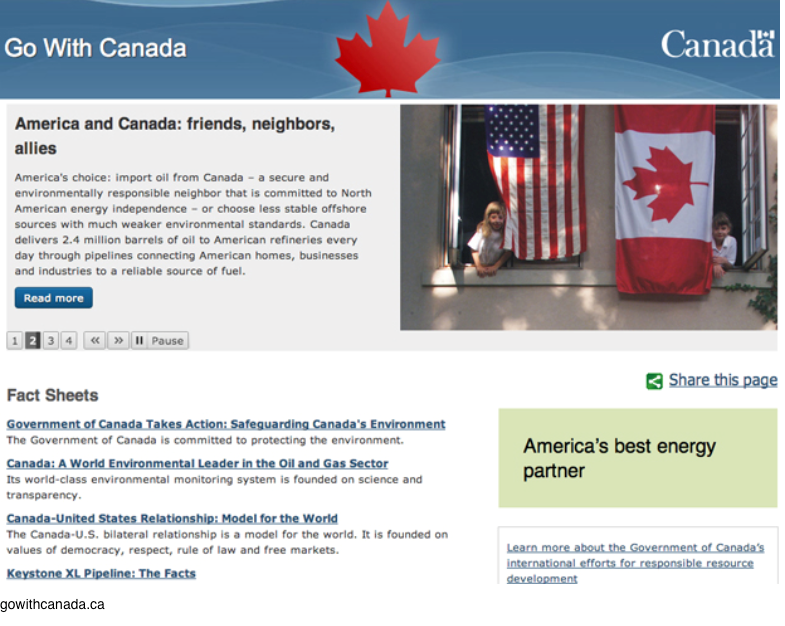 Between 2013 and 2015, in the hopes of gathering support for the Keystone XL pipeline, Stephen Harper’s government ran a multi-million dollar campaign branding Canada “America’s Best Energy Partner”––or, in a twenty-first century turn, #energypartners. The campaign had its own website and YouTube videos, along with another round of ads in the DC Metro. Canada and the United States were friends, neighbor(u)rs, allies. Government of Canada advertisements, “Report on Canada,” February 23, 1983, The Washington Post. Walter H. Annenberg, “Canada’s Unfairness Doctrine,” November 7, 1981, TV Guide, clipping in Library and Archives Canada (LAC), RG 25, Vol. 28840, File 20-1-2-USA, Part 66. “Discussion Paper: Canada/USA Relations,” July 1982, LAC, RG 25, Vol. 28840, File 20-1-2-USA, Part 69. Heinbecker to MINA, “Policy Auction: Influencing the U.S. Business Community,” June 28, 1982, LAC, RG 25, Vol. 28840, File 20-1-2-USA, Part 68. “Secretary Baldrige Meeting with Foreign Minister MacGuigan,” June 14, 1982, LAC, RG 25, Vol. 28840, File 20-1-2-USA, Part 68. Gotlieb remarks, Chicago Council on Foreign Relations, Chicago, Illinois, May 10, 1982, LAC, RG 25, Vol. 28840, File 20-1-2-USA, Part 68. Martorana email to Robertson and Parvanova, “metro poster campaign,” January 17, 2007, ATIP release no. A-2015-01365; Robertson email to Martorana and Parvanova, “RE: metro poster campaign,” January 17, 2017, ATIP release no. A-2015-01365.